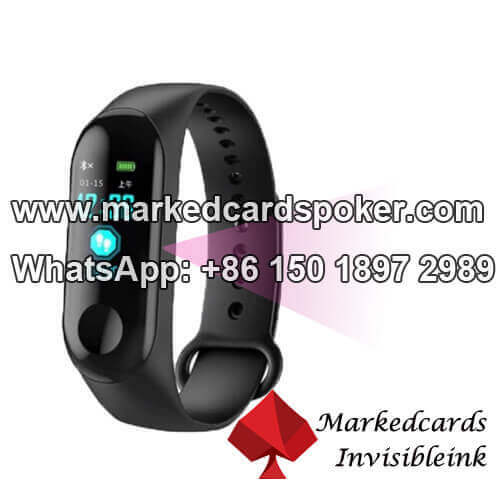 Processing a sport watch as a poker scanner is not a easy work, especially we should keep itself original function to avoid others players suspection. This black minimalist design smart sport watch poker camera with the popular rubber material come to world aroused great concern from poker players. The most attractive points are not only the stylish and lightweight appearance, but also the accurate and speed of reading the side marked cards. Although this sport watch poker camera lens are using to scan the barcode playing cards and working with verious of poker analyzer devices. To some extent, it is different from other poker scanners, such as wallet scanning camera, power bank poker reader and car key poker scanning camera. Because it was design for the cards dealer which dispatch the marked cards to each players. That why the scanning distance are short as 8-15 cm which is the most suitable scanning distance when you hold the invisible ink marked cards on your hand. Perfect appearance and great function do you a great favor in poker games or magic shows.